Shopping for Portal Prop Replicas? Fans of Portal and Portal 2, rejoice! 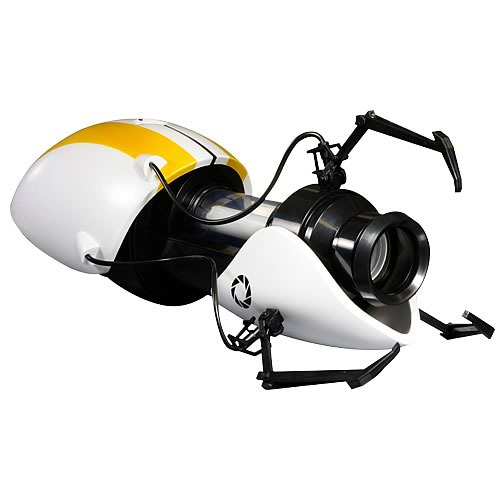 The Aperture Handheld Portal Device Replica is what you've been waiting for. It's a limited edition, so you'd better order fast! Fans of the super-popular Valve video games Portal and Portal 2, rejoice! You can get P-Body's version of the Aperture Science Handheld Portal Device! No longer are these sweet items from Aperture Science relegated to the world of the digital. Now, they're real. (Real plastic and other materials, that is.) If only we lived in a world where you could create amazing portals to transport one from place to place. That would be the life! Oh well, it looks like you'll just have to make do with your imagination, video games, movies, and television shows. At least you can pretend, however, with this amazing Portal P-Body Aperture Handheld Portal Device Prop Replica. It's a limited edition of 5,000 pieces, so you'd better order fast! Requires 3x "C" batteries (not included). Ages 14 and up. Due to popularity, this product is limited to one (1) per client. Please note item is limited to USA only.